If you ask us, we think technology is pretty amazing. It transforms what we can do, and simplifies how we do it. For example, errands that used to fill your day–like grocery shopping, banking, and buying new clothes for the kids–can now be done by the touch of a couple buttons right on your smart device. While digitally marking things off your to-do list is convenient, it can easily lead to a loss of focus on a very important part of your connected life: protecting your personal information. Cybercriminals are an unfortunate reality of today’s world, and they’re always looking for ways to get ahold of information that’s not their own–phishing emails and over public Wi-Fi are two of their favorite methods. Thankfully, companies like Google and Apple have stepped up their security game, and developed better ways to help people protect their sensitive information. Here, our tech experts explain two factor authentication and how you can use it to make sure your information is secure. If you use iCloud or Google accounts you’ve probably heard of two factor authentication. It’s a security method that asks you to take an extra step — usually entering a code — to confirm your identity when you log into email, social media, or other password protected accounts. This second layer of protection is designed to keep other people from signing in to your account, even if they have your password. 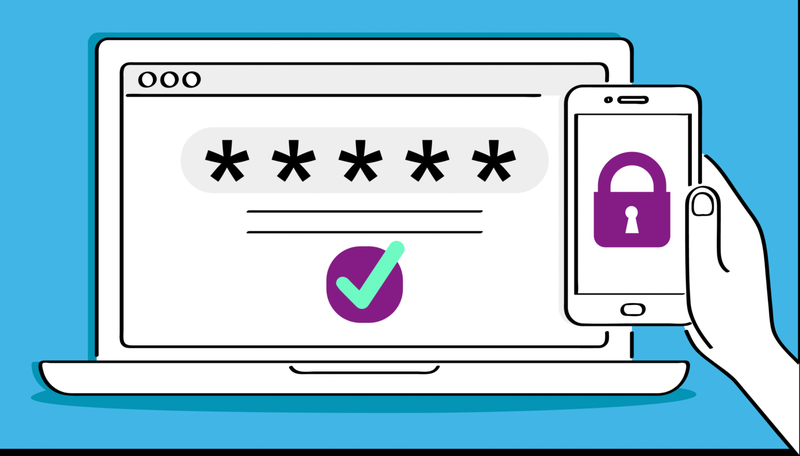 Receive a verification code that’s automatically sent to one of your trusted devices or accounts, and enter that code on the login page. You can customize your settings to choose how the verification code should be sent—text, phone call, email, or push notification. Sign into your Google account from a computer. At the top right of your screen, tap the round personal profile icon > Google Account > Security > 2-Step Verification. Choose how you want to receive your verification code (text message, phone call, or a push notification) and confirm that you received it. Open Settings and tap your name in the banner at the top of the screen. Tap Password & Security > Turn on Two-Factor Authentication >Continue. If you see a warning about older devices, tap Turn on Anyway. Make sure your phone number is correct. Then, choose text message or phone call as your verification method. Tap Next and enter your Passcode. In the top right-hand corner, put your mouse over Account & Lists > Select Your Account. You’ll be asked to sign in to your account again. Type in your login information and click Sign In. Find Advanced Security Settings and click the Edit button to the right. Choose how you want to receive your security codes. (Text message or automated phone call.) Enter your phone number. Hit Send code. You’ll receive the code to your mobile phone through text for phone call. Enter the code then hit Verify code and continue. Next, you’ll set up a backup verification method in case you didn’t get the code sent to your phone. Apple, Google, and Amazon aren’t the only companies that use two factor authentication to keep your data safe. Others like Twitter, Facebook, and Instagram also offer the feature. We make it easy for you to take control of your tech and uncover the amazing new things you can do. If you need assistance setting up two factor authentication, or if you have a security question, our tech experts are here to help.